After a quick trip to Moscow on Sunday and Sochi yesterday, to work on a Russian Louis Vuitton Trophy event in 2011, I arrived in Austria late last night. Gmunden and its Lake Traunsee is the site of the second event on the RC 44 Championship Tour of 2010. Lake Traunsee is spectacularily beautiful with 2000 meter mountains rising right up out of the lake. There is still snow in those mountains so it is not the normal sailing scenery. The tall mountains do make it challenging for the wind. Today was our first training day on Katusha. The sailing was sporadic as the wind filled first at the south end of the lake then died there and filled at the north end, albeit from the south. We trained with our partners on Artemis. I felt a bit rusty, probably the 30 hours of flying since Saturday didn't help. Tomorrow is the weigh-in so sauna first thing as we need to drop 15 kgs as a team. Then another training day, then we will get the match racing part of the event underway on Thursday. 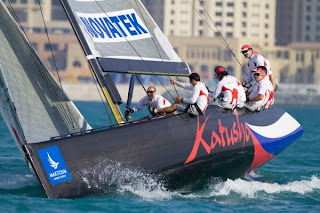 The fleet racing will start on Sunday and the event concludes on Tuesday the 4th. Ten teams are here including two teams from America's Cup winner BMW Oracle. Skipper Larry Ellison with tactician Russell Coutts were out training today, as were 9 of the 10 teams.